Definition at line 138 of file llviewerpartsource.h. Definition at line 424 of file llviewerpartsource.cpp. Definition at line 517 of file llviewerpartsource.cpp. Definition at line 430 of file llviewerpartsource.cpp. Definition at line 511 of file llviewerpartsource.cpp. Definition at line 463 of file llviewerpartsource.cpp. References f, F_TWO_PI, LLViewerImageList::getImage(), LLControlGroup::getString(), gImageList, gViewerArt, gWorldPointer, LLPointer< Type >::isNull(), ll_frand(), LLPartData::LL_PART_INTERP_COLOR_MASK, llmax(), llmin(), mColor, LLViewerPartSource::mImagep, LLViewerPartSource::mLastPartTime, LLViewerPartSource::mLastUpdateTime, LLViewerPartSource::mPosAgent, LLViewerPartSource::mSourceObjectp, LLMemType::MTYPE_PARTICLES, and updatePart(). 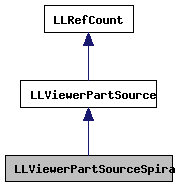 Definition at line 438 of file llviewerpartsource.cpp. References F_TWO_PI, LLPointer< Type >::get(), LLPointer< Type >::isNull(), LLViewerPart::mLastUpdateTime, LLPartData::mMaxAge, LLPartData::mParameter, LLViewerPart::mPartSourcep, LLViewerPartSource::mPosAgent, LLViewerPart::mPosAgent, LLViewerPartSource::mSourceObjectp, LLMemType::MTYPE_PARTICLES, LLVector3::mV, VX, VY, VZ, x, and y. Definition at line 151 of file llviewerpartsource.h. Definition at line 153 of file llviewerpartsource.h.